A carport is a safe port for your car. Carports protect your car from the weather and the sun. Unopiù’s wooden carports have a modern and elegant design and are made exclusively from premium materials. The prefab wooden carports are available as single or double carports. They are easily extendable with matching extension modules. Our wooden car shelters are made from treated Nordic pine and are available in different colours. Colours from the Unopiù Colour range can be used to paint the wooden car shelters in the colour of your choice. Our car shelters have room for one or two cars. Unlike a garage, a carport has at least one open side and cannot be locked. This open construction makes carports very light and airy. They are quite elegant and let light into their neighbouring areas (such as the house, the patio, or the garden). They don’t usually require building permits or adherence to fire protection requirements. Their openness and their light-flooded airiness make them a sophisticated architectural design element in the outdoor area. They do not only protect the car but also give it a stylish and luxurious frame. A carport can also build an elegant optical border and create a clearly defined parking space in an otherwise open area. The open and airy structure prevents toxic exhaust fumes from accumulating. Moisture dries off quickly so that the car is protected from rusting. The car is also visible at all times. 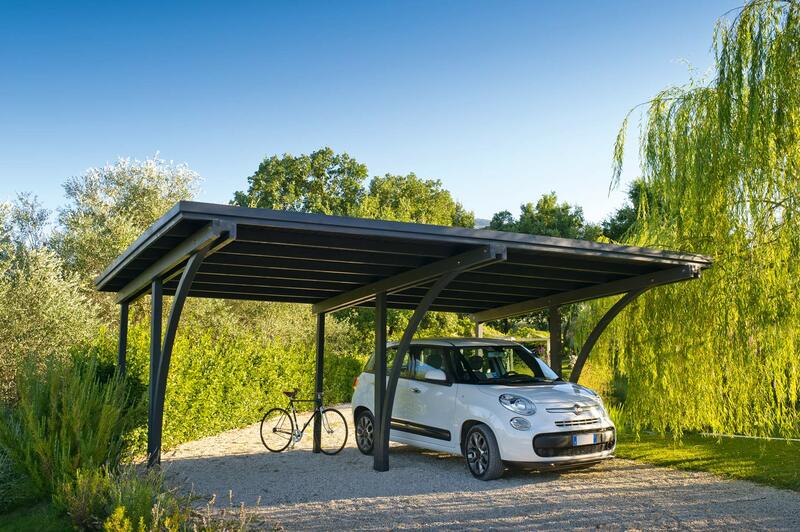 Unopiù carports are durable and weatherproof wooden constructions that can be expanded using infill components. Windows and wall panels are also optionally available. Other elements such as trellises or flower pots can be used to make the carport even more individual. Unopiù’s concept of transferring stylish furniture and design elements from the inside to the outdoor area means that your car can now have a sophisticated frame made in Italy as well.